Almost 7 years ago, at age 13, Pharoth came to the gate of Roteang Orphanage crying, with her baby brother Darith in her arms. Their Mother had died and their step father had disappeared, and Pharoth was living with the baby on the earthen floor under an aunt’s house in Roteang village. She was crying because they had no food-she was making Darith’s feeding with one scoop of formula powder to 11 ounces of water or sometimes just feeding him sugar cane sweetened water. They had no clothes. The aunt would not let her go to school, which she desperately wanted to do, as she had to care for the baby and also work picking about 30 cents worth of morning glory daily for income for her aunt. After negotiations with the aunt, the Sharing Foundation was allowed to admit Darith to the Orphanage and to provide clothes and supplies for Pharoth to go to the local school and a small amount of money weekly to the aunt to replace Pharoth’s earnings. With a Sharing Foundation generous sponsor who not only covers her school costs, but also provides moral support through quarterly letters, Pharoth was able to attend an English school in Phnom Penh. When I was invited to keynote and lead workshops at the Cambodian Bloggers Summit this summer, I collected technology and nonprofit t-shirts to bring over. People responded generously. (so genersously that I had to pay for an extra suitcase to carry over all the t-shirts that were donated) and had enough extras to bring to the children in the orphanage. 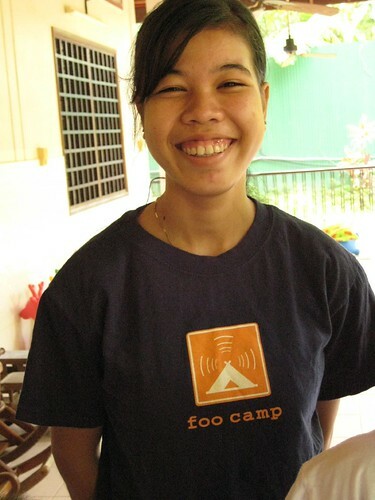 One of the most generous t-shirt donations came from Citizen Agency from Tara Hunt and Chris Messina packed up a big box with coveted Web2.0 t-shirts , including Tara's foo camp t-shirt that you now see Pharoh wearing. There has already been over $20,000 for the Sharing Foundation's America's Giving Challenge raised through the unselfish giving of over 750 people like Tara Hunt and Chris Messina. If you have not yet donated $10 (or more) to this important cause, there is only 48 hours left to donate and change a Cambodian child's life!